This interview took place on: 5/3/11. JFH (Scott Fryberger): So you recently finished recording your new album. How long were you in the recording studio? Braille: What I basically did with this record is that I spent about eight or nine months collecting the beats, and then I just got ideas in my head, and then spent five days in the studio in Denver, Colorado, tracking all the vocals. So all the beats were ready to go, except one or two that we made on the spot. And then I kinda pieced together all the rhymes and recorded them all in those five days. JFH (Scott): That's pretty fast. How long do you usually spend in the studio? Braille: Well, my last four albums have all been recorded at my house. But the standard thing for this is that I like to finish my writing right before I record my vocals. So it's pretty typical for me to spend a couple hours on a rhyme and then record it right there. Some rhymes take longer or some rhymes get more revised. But you know, it's either I like it or I don't. If I don't like it, I don't even do nothing with it, I just throw it away, and if I like it, I'll work on it till it's right. And then if I'm laying it down in the booth and a couple things need to be changed, then I'll just change them right there on the spot. JFH (Scott): Native Lungs is going to be your seventh album, right? Braille: Yeah, this is my seventh official solo record. I did a couple tapes before I started counting them as official records, so I have like two solo tapes and one kinda unreleased tape, but it's my seventh official solo record. JFH (Scott): That's a lot of rapping. Braille: Yeah, it's been pretty much all I've done the last fourteen years of my life. It keeps on happening. JFH (Scott): For Native Lungs, who all did you work with as far as producers and DJs? JFH (Scott): Who did you have for guest vocals? Braille: Guest vocals ended up being only two guys: Theory Hazit and Odd Thomas. I also had guest verses that were gonna be from Propaganda and Boogalu from Alert, but the timing just didn't work out. What I really wanted to do was fly all the guest vocalists into the studio with me so we could all record on the same mic, so it sounded together, but we just didn't have the budget for that. Also J.R., who many people might be familiar with, he was gonna do the chorus on a song, and the timing just didn't work out. But aside from that, the DJs doing cuts include Ralph Swift, DJ Revolution, DJ Idull and a few others. JFH (Scott): So this album almost turned into somewhat of a Humble Beast family reunion. Braille: Yeah! On my solo records, I tend to focus on featuring the guys from Humble Beast because I have such a close relationship with them and my solo records tend to be so personal that it's hard to just throw somebody on a record just because I think they're dope. I just feel like a close friend could make a good addition on a personal song. JFH (Scott): Speaking of the budget, you're running a campaign on IndieGoGo right now. What is the money from that campaign going to be used for? Braille: Well, basically, we went all-out in the recording of the record and spent a lot of extra money - more than we usually spend. Just to take the quality level up a couple levels. When I record at home, I'm usually recording on like a $500 microphone, but on this record I was recording on a $10,000 microphone. So the sound quality is on a whole other level. So the campaign is to raise money for mixing and mastering, so that we could hire some professional guys. The two lead singles are being mixed by a guy named Eddie Sancho, who has done a lot of mixing for Gang Starr and Dilated Peoples and a lot of other artists that have a sound that I think is in the realm of how I think my stuff should be mixed. And then for mastering, we're hiring a guy named Tony Dawsey, and he mastered the last nine Jay-Z albums, Nas' [album] Illmatic, as well as stuff for Moby, DMX and many others. So the campaign is just to help us hire some professionals that have a proven track record of doing a very good job with the style of hip hop that I do. And I felt it was important to see what the difference is. You know, I've worked with great engineers in the past, and this is just an opportunity to work with some guys who have been doing the style of hip hop that I do and had their hands and ears on it for a long time. So they know what they're doing, and I feel like it'll help take it to the next level for sure. JFH (Scott): That's some big name talent right there. Now is there a particular reason you decided to go with IndieGoGo instead of Kickstarter, which a lot of bands have been using lately? Braille: Yeah, well Humble Beast has been planning to do a Kickstarter for a long time. We were actually just gonna do one for the label as a whole and then use that money to start funding some of the records. But it looks like, with IndieGoGo, some of the perks on our end are a little more artist-friendly. With Kickstarter, if you don't meet your goal, you lose all the funds, and I think the percentage that they take is higher. So really, we went with IndieGoGo because it seems a little more independent artist-friendly. JFH (Scott): Makes a lot of sense. What are some of the topics you cover on Native Lungs? Braille The topics on Native Lungs are pretty broad. One of the ideas with Native Lungs is kinda looking at where I came from, all those influences and what I took in, and what God has essentially shaped out of that. So whether you're looking at the influence from your biological family, the influence from hip hop culture, the influence from American culture, the influence from just living in this world, all those influences. And on top of all that, you get impacted by the Gospel, and then your heart changes, and it changes the way you view all those other things. It changes the way you view your biological life, it changes the way you view your music culture, it changes the way you view the culture of the world, the culture of your city, your country, all those things. So it's basically taking all those things, all the things that I've learned, but then applying the Gospel to that, and seeing how that impacts and affects how all those things come back out. Essentially, I breathe in all this stuff, and then I breathe it all back out, and it's been changed because it's been inside of me and I've been changed from the inside. And everything that's coming out is coming out through this new filter. And that's kinda what Native Lungs is. I'm really going back to making a style of hip hop that I grew up on, and kinda putting my own spin on it and not holding back. Just trying to make the best sounding hip hop, but it's coming through this new filter, and as I'm breathing it back out, it's Gospel-saturated because my life has been saturated by the Gospel. So I think that a lot of listeners will see that the Gospel is more evident in this new music. I talk about sin, salvation, sanctification, repentance and things like that a lot more candidly than maybe I have in the past. It's still written from a personal lifestyle perspective. But the appropriate words based on my worldview are used to communicate those things within a biblical framework. I think the Lord has moved in my life in such a way that the way that I communicate some of the same topics and concepts I've always communicated - there's just more clarity. And I think that the sound quality and message and everything is just done with a lot more clarity than in the past. There's just really no holding back on this record. And I think the record benefits from that in a lot of ways. JFH (Scott): And what are some of the songs you're most excited about people hearing? Braille: It's so hard, because the record is so new and so fresh that I'm excited about a lot of songs. There's a song I did with S1 called "DeepRest." I really really like that one. I kinda wrote it on the spot and it turned out really good. The intro song, titled "Native Lungs," I also wrote on the spot in the studio, and I was really happy with how that one turned out. There's a song I produced myself called "We Will Remember," and it's the first time a self-produced song has made it on one of my records, so I'm kinda excited about that one as well. JFH (Scott): And do you have a projected release date for the album? Braille: Yeah, August 30. So we're trying to work way ahead of the schedule on this one. Most of my records have just kinda come out on the day I finished them. No real promotional campaign, other than The IV Edition, which I think was my most well-promoted record. But with this one, we've got a pretty extensive promotional campaign for the record. It's really exciting. We're gonna shoot four music videos for it, and we're working really hard, and the record's gonna be free. It's gonna be a free download from Humble Beast like all of our records are, and my goal is to give away 100,000 downloads. It's a lofty goal, so we need a lot of promotional time in order to accomplish that. So that's why it's not gonna come out till August 30. JFH (Scott): That's a huge goal. Do you think it will be easily attained? Braille: I don't think it'll be easy, but I definitely think it's possible. And basically after the first couple weeks, when we see how many downloads we get, we'll be able to assess to what extent we need to step it up. But I'm willing to do whatever it takes, and really there's no disappointment for me. It's not like if we didn't reach 100,000 then the record would be a failure. It's more like - things like that don't typically happen on accident, and so you have to develop a game plan if you wanna take things to the next level. So everything is being done strategically, and we're shooting high just so that it pushes us to take it seriously. And that's where we're at with Humble Beast. Even though we're producing free content and resources, we're striving for excellence in such a way that we're treating every record as if it's coming out on a major label, rather than just treating it as an independent record. And in that, it's enabling us to plan things out, and be strategic, and just try to be good stewards over the resources that God has blessed us with. JFH (Scott): That brings up another question I've had for Humble Beast as a whole. What inspired you all to give away music for free? 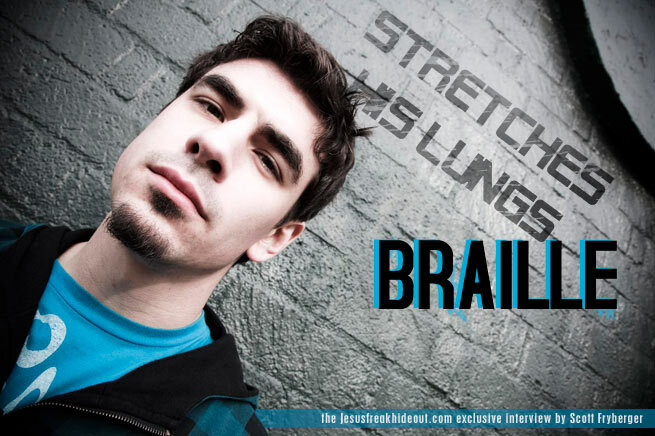 Braille: It's something that I started doing in 2009 with the Cloudnineteen record. I gave away 15,000 CD's. And then Thomas - me and Odd Thomas co-own Humble Beast - had the idea. He wanted to start a label of his own and give away the music. I had been doing that as well. And there's a lot of reasons. Part of it is just that there's a lot of people we're not able to reach through marketing, just because we don't have the marketing budget to reach those people. So even when I was doing Cloudnineteen, the reason I wanted to give it away was because a lot of times I'd do a concert for 150 kids, and I'd only sell maybe 20 CD's, but there were 130 kids who left that concert and not only didn't have the CD, but probably would never get a chance to buy it because it's not mass distributed in a lot of retail stores. And then a lot of the kids that we do shows for can't buy the record anyway, so the idea is that anyone that we're able to cross paths with, we're able to put the resources in their hands without having some sort of cost or distribution get in the way. So the idea is really to reach the largest audience possible with the raw product we're producing and not have business get in the way of what kind of content we make and who we can give that content to. So it really helps us with the integrity of the artistry and the integrity of the audience we wanna reach. We wanna reach anyone who's interested in what we do without any barriers between us. JFH (Scott): Have you heard any good testimonies from listeners who have downloaded your music? Braille: We're blessed to get good testimonies all the time. It's really encouraging, and that's what's kept me going in the music industry as an independent artist for so long. I've been doing music full-time since 1999, and the testimonies I've received over the years are what have really kept me going, and that's kinda the same thing for us, as a label. You see the fruit constantly and receive emails constantly, it motivates us and helps us to push even harder. JFH (Scott): And who can we expect releases from out of the Humble Beast family this year? Braille: Next up, Odd Thomas is working on something, and Theory Hazit's working on something, and Xperiment's working on something, so we have a lot of new stuff coming out. JFH (Scott): And that's all coming in 2011? Braille: eah, that's all 2011. Odd Thomas, Theory Hazit and Xperiment are gonna be the other three releases besides mine that are gonna come out in 2011. JFH (Scott): Cool. I can let you get back to doing what you're doing, but is there anything else you'd like to add? Braille: I think that's it, man. I really appreciate the support, and I appreciate everyone who's taking the time to read this. Definitely check out the campaign and see what we got going on, and yeah, we're excited to get the record into everyone's hands. Braille's new album Native Lungs releases August 30, 2011!